The Hunter 99119 Fan/Light Universal Remote Control allows for complete fan and light operation with fans that have three speeds. This remote features separate buttons for three fan speeds plus an "instant off" button, as well as full-range light dimming. (with CFL’s, the remote will control the lights, but the dimming feature might not function. This is a limitation of CFL bulbs. This remote has a toggle switch that allows use of this remote with compact fluorescent bulbs. The 99119 comes with a wall cradle for the handheld remote control. 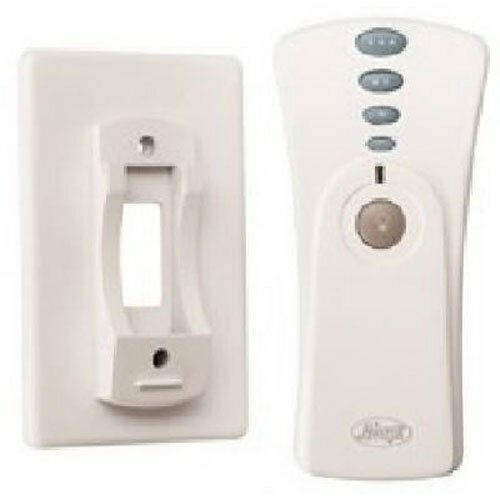 This remote is designed to work with all brands of ceiling fans, however, a few non-Hunter branded ceiling fan models might have smaller than normal housing or canopy’s that are too small to accommodate the receiver unit for this remote control. Customer Care Number: 1-888-830-1326 (US) & 1-866-268-1936(Canada) CONNECT WIRES FROM RECEIVER TO FAN - Using the blue wire connectors connect the white wire from the receiver (marked “common out”) to the white wire from fan. Connect the black wire from the receiver(marked “fan out”) to the black wire from the fan. Connect the blue wire from the receiver (marked ”light out”) to the blue wire (or possibly black with white stripe) from the fan.